We specialise in corporate sailing activities whether for team building, client entertainment or just fun days out. LOCATION: UK South coast and anywhere in the world ! 17 years providing yacht CHARTERS !!! Consult our sailing calendar for the special events during the year. 40' yachts are ideal for a corporate team building or fun day out. 6-9 crew per boat allows plenty of scope to participate and an ideal structure for a team build. The yachts come with experienced crew and all the safety and weather gear for the event. See below for a typical schedule. 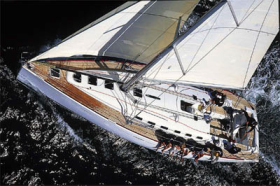 47' yachts - The Beneteau First 47.7 is a racer / cruiser providing a great day out for up to 12 guests on a top-class yacht. We have a fleet of 5 yachts available for charter. The yachts are very spacious and quite easy to sail, great for team-building and client entertaining. 60' yachts - Volvo open 60's are amongst the fastest and most exciting yachts in the world for a corporate team building or fun day out. 8-16 people per boat allows plenty of scope to participate and an ideal structure for a team build. The yachts come with experienced crew and all the safety and weather gear for the event. From £135 per head for full day. A sailing event can be anything from a fun day to a full-on team building day. We will provide experienced corporate skippers and crew and are able to take novices through to experts. Breakfast and lunch can be provided either on the boats or ashore and the day can be rounded off with celebrations and prizegiving as required. Evening meals and accommodation can be organised locally to the event. Corporate sailing charters are excellent for teambuilding and the Solent is one of the best sailing arenas in the world. Dine in style at one of the Isle of Wight's restaurants or have a 3-course buffet style lunch on board.